We are looking forward to adding the final chapters to our Aroma Tours chronicles for this year and will share some of the stories of our Bali and Tuscany adventures with you in our October newsletter. Robbi and I are also thrilled to see that our 2014 tour season is already off to a flying start with an unprecedented number of early bookings, mostly from our returning Aroma Travellers and their friends. Robbi and I also enjoy sharing with you some of lovely images taken by our guests during their journeys with us. This year we are enjoying an outstanding number of returning Aroma Travellers and new guests who are joining us because of direct referrals - currently over 55% of our guests! Your appreciation that we have shared such a special time with you during our journey together means so much to us and make us very happy indeed. Seeing the world with Jim and Robbi is a revelation. My third and fourth tours this year - Spain and Turkey - were superb in every way and beautifully organized by two extraordinary people. Tuscany beckons next year for more fun! A thousand thanks to you both for making so many of us who travel with you very happy! My trip to Provence the BEST vacation ever! I loved the lavender tour it was a treat for all the senses as well as informative, beautiful, humorous, delicious, etc.. Robbi and Jim I'd like to thank you for your warmth and generosity. I enjoyed meeting you and look forward to my next Aroma Tour. It was fun traveling with friends I just met. Thank you for making our Aroma Tour a very special time. The care and attention to the individual needs of the tour group was much noticed and appreciated. We had a great trip and will hopefully experience another tour with you again in the future. Thank you Jim and Robbie for a wonderful trip to Turkey. It was a super trip with a fun group to an amazing country - what more can one ask! 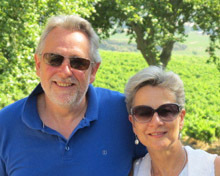 Thank you so much, Robbi and Jim, for sharing Provence with Bob and I. It was the most lovely, special week. We loved your energy, attention to detail, generosity of thought and wisdom. We met some fun, loving and personality plus people. I still can smell and see the lovely lavender and beautiful scenery in Provence. The trip was a perfect combination of sights, sounds, history, relaxation and of course shopping. I am amazed at all that you do and maintain your sense of humor and calm demeanor. You just may see us again sometime. Thanks again!! Jim and Robbi, I don't know if thank you would be enough for all you brought into my life. The Lavender fields were a dream come true for me and sharing it with such wonderful people made the dream deeply heartfelt. It was all an experience of a lifetime and so much more than most tours would provide. The lavender hasn't left my dreams. It is a challenge to express the delectable moments we shared but hopefully your eyes will enjoy dining along with us. Robbi and I hope to share some of these delicious moments with you in the near future. Our 2014 tour season is off to a flying start with an unprecedented number of early bookings, mostly from our returning Aroma Travellers and their friends. All of our tours for 2013 were fully booked, however, due to a late cancellation we currently have 1 vacancy for our Bali Women's Retreat 16 - 23 September 2013. Creme de Cassis is a popular liquor made in France from blackcurrants which are generally grown in the cooler regions of Burgundy as well as the Loire and Rhone valleys. The blackcurrant plant needs to be subjected to below freezing temperatures for 10 weeks or more during winter in order to produce abundant fruit and even then the berries only maintain optimal flavour for one day! Also, because they are very quickly oxidized once picked ( due to their high vitamin C content ), they must be flash frozen to -30C as soon as possible in order to preserve their colour and flavour. To create creme de cassis, the flash frozen berries are warmed to -5C and macerated for up to 3 months in a mixture of water and alcohol which extracts the flavour and colour from the berries without the possibility of fermentation. The resulting juice is then decanted, pressed and filtered, then sugar is added. This style of macerated liquor is given the name "creme" to differentiate it from fermented liquors such as Marc, Armignac, Calvados and Eau de Vie. The French name for blackcurrant is cassis, hence the liquor was called Creme de Cassis. It was the mayor of Dijon, Canon Felix Kir, already famous for his involvement in the French resistance, who is credited for preserving the tradition and knowledge of making aperitifs during the difficult years of the 2nd world war. Mayor Kir would often be seen offering guests to the capital of Burgundy the traditional blanc cassis, a combination of dry white wine and creme de cassis which eventually became know as a "Kir". Other drinks incorporating creme de cassis are:- Communard, a dash of creme de cassis plus a cool dry red wine such as passe-due-grain or, a personal favourite, Kir Royale - a blush of creme de cassis in champagne. 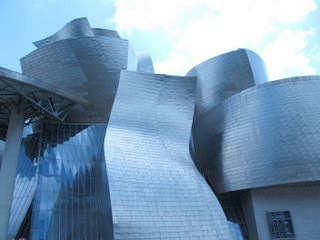 During our Flavours of Spain Tour we visit the spectacular Guggenheim Museum of Modern Art in Bilbao, recognized as a masterpiece of 20th century architecture and one of the world's most spectacular buildings. It is a triumph of inspiration, planning, cooperation and execution and was realized as the result of the Basque government's vision to revitalize the struggling port city of Bilbao. The idea was to create a world class museum for contemporary art which would attract visitors and create new prosperity. With that in mind, in 1991, they approached the Guggenheim Foundation in the USA to propose that a Guggenheim affiliated modern art museum be built on a 32,500-square-meter site along the Nervion River in the old industrial heart of the city. The commitment was as large as the vision, with US$100 million set aside for construction, US$50 million for an acquisitions fund, a one-time US$20 million fee to the Guggenheim Foundation and agreement to subsidize the museum's US$12 million annual budget. The Guggenheim Foundation agreed to give their name to this new museum which they would design and manage, as well as rotating part of their permanent modern art collection and organizing temporary exhibitions. Canadian architect Frank Gehry was chosen to design the building and was tasked to create a daring and innovative design; which he most certainly did! His stunning concept utilized three key elements: glass, titanium, and limestone in seemingly random curves, "to catch the light", positioned around a central flower-like atrium. This amazing building ( even more amazingly ) was constructed on time and under budget and was opened on October 18, 1997 King Juan Carlos I of Spain. 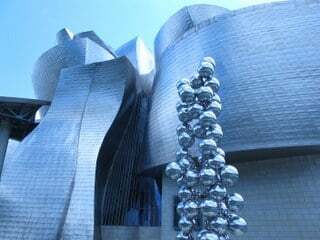 Almost immediately, the Guggenheim Museum Bilbao became a popular tourist attraction, drawing approximately 4 million visitors from around the world in its first 3 years and adding almost �500 million to the local economy! Not only was Bilbao's economy strengthened but the taxes raised from hotels, restaurants, shops and transport more than paid for the cost of the project. Visiting the Guggenheim Museum Bilbao is a total feast for the senses, especially with our colleague, art historian and bon vivant Carol guiding us expertly through the amazing exhibits. For the latest details of our tours and retreats, please visit our information request page and if you would like to join us for one of our delightful aromatic journeys, please visit our booking request page to reserve your place.